Honda Tohru is the center of Kyo's world. When he first sees her, it is as a child while her mother is out. Little Tohru is eating by herself and looks so sad… Kyo thinks that she and her mother are the type of people who deserve to never be sad and vows to protect them from that point on so that they may be happy. He even makes this vow later to Kyoko when Tohru goes missing, saying he promises to find her and protect her. This section is a very long one so I've done my best to split it up into smaller sections to make it easier to read. When I first got interested in Fruits Basket, it was back when the anime was still airing in Japan and the manga was only about half-finished. The Tohru-Kyo-Yuki love triangle was very much alive and to us fans back then, it really could have gone either way. Personally, I had always rooted for Tohru x Kyo… Maybe I was biased since Kyo was my favourite character but I felt that he needed Tohru's love and acceptance more than Yuki did. There was a lot about Kyo's past that we didn't know at the beginning but knowing that he was ostracised by everyone made me really empathise with his character. When we see Tohru accepting Kyo after seeing his true form, I really felt that this was the girl that Kyo needed in order to heal from all of the hurts he's had to endure. Plus, the pair are just too adorable during their "I think I like her/him" phase. Brushing their hands against each other and freaking out about it, Kyo getting way too embarrassed when anyone else sees him acting tender towards Tohru… it killed me. xD It's one of the things I like the most about them; they feel very real. How many times have we ourselves been in that situation? They're relatable! I was really happy when the series revealed that they had feelings for each other and even more-so when they ended up together in the end. It's fairly evident that Kyo needed Tohru in his life. As the only girl to ever accept him in his true form, she proved to Kyo that there are people in the world (outside of Kazuma) who can look past his faults and love him for who he is. This was probably one of the most important moments in Kyo's life and it's when he began to fall in love with Tohru. Their bond only strengthened with each moment they were able to spend together afterward. Likewise, I believe that Kyo was really needed in Tohru's life as well. She clung to her mother's memory in fear of being alone, which makes her relate to Kyo in a way. Her fear made her feel so guilty that she didn't want to admit to herself that Kyo had replaced Kyoko as the most important person in her life… but Kyo's relationship with her mother -- something only he experienced -- probably helped Tohru come to a safer place where she could accept that her mother was still in her life. Maybe it was destiny? 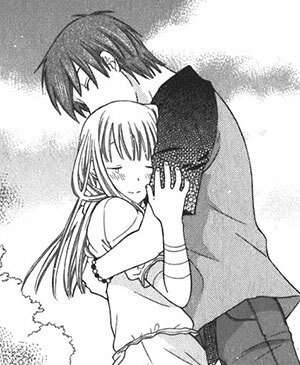 Either way, Kyo really did live up to his promise of taking care of Tohru for the rest of his life. I'm also very happy that Takaya Natsuki has decided to bring us Fruits Basket another! We may not see Kyo or Tohru in it, but we meet their son, Sohma Hajime. Through him and his cousins, we learn a bit more about how Kyo and Tohru are after the events of Fruits Basket; Hajime is a complete mama's boy and I can just imagine how adorable Tohru is as a mother. x3 Hopefully we'll learn a little more in the future!